pregnancy, parenting and baby guide for awesome parents! Read the original post The 4 Best Whole House Dehumidifiers Models (Keeping Your Home Air Healthy and Safe) on BabyDotDot - Baby Guide For Awesome Parents & More. Is the humidity in your home too high? Are you still confused with choosing between portable or whole house units? How do you decide and once you do, are the recommended brands or models? We take the hard part of researching and choosing by selecting the best whole house dehumidifiers in this post. Humidity in excess of 70% causes problems, both for your health, as well as the things inside your home. The ideal relative humidity for health and comfort is about 45-55%. Excess moisture in the air encourages the growth of molds and mildew, as well as the proliferation of dust mites, termites, and other pests. Especially for dust mites, it will cause young children to suffer from issue like irritation, inflammation and infection. ​Furthermore, the high moisture can lead to corrosion and decay of item around your home like the wallpaper. To keep your family healthy and your home safe, the use of dehumidifiers is recommended. Also, always have a portable humidistat monitor to help you keep an eye on the humidity level around your home. Generally, in the market, you can either buy a portable dehumidifier unit or a unit that install onto your home HVAC system. While both types have their pros and cons, but before deciding, let’s compare the advantage and disadvantages of both types of dehumidifiers. If you are looking for a portable dehumidifier, we have previously written a post about portable dehumidifiers and the list of the b﻿﻿est portable dehumidifiers for home use that you can check it out. As for the benefits of using dehumidifiers, here’s a brief overview. At this point, you have a choice between portable dehumidifiers or whole house dehumidifiers. Which should you choose? Both comes with their unique advantages, as well as disadvantages. But the best way to determine which type is suitable for you, consider how you plan to use the unit and the coverage space. Portable dehumidifiers are cheap. It can be used to lower humidity in one given area where the unit is placed. Being portable, you can use it in other parts of your home. It is easy to operate and can almost be used out of the box with minimal preparation. As great sounding as portable dehumidifiers is, it does have its shortcomings when compared to whole house dehumidifiers. For example, portable units often have shorter service lifespan. Also, a portable dehumidifier might generate noise when use, and covers only one area. You will have to empty the collected moisture frequently. Portable dehumidifiers are also less energy efficient. Compared to portable units, whole house dehumidifiers are more expensive initially. Because they are much more energy efficient, it becomes cheaper over a period. They are hidden from sight and can dehumidify your entire home. Whether you spend a few hours installing or hire professionals to install for you, that is only at the beginning. Over time, you will appreciate the lesser to virtually no maintenance. You should consider whole house dehumidifiers if you need to control the humidity of multiple rooms and other areas in your home. While it is possible to purchase multiple units of portable dehumidifiers for use in different parts of your home, it is less efficient. Furthermore, you have to take into consideration that each portable unit comes with maintenance each time it is used. On the other hand, maintenance for whole house dehumidifiers typically is once or twice a year. Also, if you are living in a large house with multiple floors, you should seriously consider whole house dehumidifier as it will be cost efficient in the long run. Although there are high-capacity portable dehumidifiers that have large coverage space, none performs even near the same level of efficiency as units that are attached to your home humidification system. For that reason, we selected the best whole house dehumidifiers that are ducted. When it comes to home humidification systems for the whole house, Aprilaire leads the way. It comes as no surprise that Aprilaire was chosen as one of the best whole house dehumidifiers for your home. Aprilaire models 1830 and 1850 dehumidifiers are high-capacity solutions to take charge of your home’s humidity. These models are installed as part of your home’s heating and cooling system. The Aprilaire models 1830 and 1850 can work independently of your cooling system or hand in hand by pulling air from every room in your home, removes the moisture and sends back dry air. GeneralAire’s whole house dehumidifiers are great alternatives for AprilAire. Both the DH70 and DH95 have a wide variety of installation and control options. Once the unit is properly installed to your home humidification system, the operation is as easy as setting the humidistat. If you prefer to, the optional control system allows you to use WiFi to control your dehumidifier. Common household allergens such as dust mites, molds, and mildew, thrive in the humid environment. Humidity level is affected by the climate. During hotter months, moisture level tends to be higher. Small confined spaces and less ventilated areas such as bathrooms, kitchen, basement, are usually where moisture tends to build up the most. In our case, the storage room under the stairs and pantry is troublesome for my family. I always find molds and mildew grow inside the cabinets and I have to clean them off consistently. Dehumidifiers are used to bring down humidity level to make a comfortable living for you, and prevent common allergens from growing. I think of these allergy triggers as being similar to cockroaches and pests, which needs to be eliminated or taken care. If any of your family members are constantly suffering from the conditions mentioned above, check the humidity level of your home and consider using one of the best whole house dehumidifiers we have selected on this post. 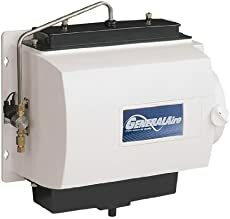 Generally, Aprilaire and its alternative, GeneralAire are the best dehumidifiers brands you can find in the market that do remarkable job at conrolling and removing excess moisture at places like bedrooms, living or family room, kitchen, basements, and crawlspaces. 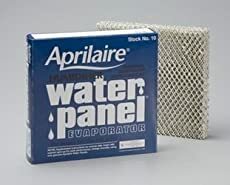 ​From our research over hundreds of whole house dehumidifiers, without a doubt, Aprilaire and GeneralAire dehumidifiers deserves to be on top of the best whole house dehumidifiers for your home. Read the original post Interview With Suhail Abidi the Founder Of Tinystep on BabyDotDot - Baby Guide For Awesome Parents & More. Tinystep is an app for pregnant moms and new mothers to ask, connect and share. Especially for the new moms, getting the answer to your questions can be difficult at times. This is where Tinystep excels at bridging moms around the world to connect and share information, so you do not feel alone in the parenting and pregnancy journey. Making friends with the mother community is a breeze with the app. Different chat groups in the app can let you connect to your desired topic like baby names, baby care, pregnancy, baby essentials, breastfeeding, pregnancy fitness, parenting hacks, pregnancy myths and much more. The app also has tools that help both mothers and pregnant women like growth charts, pregnancy tracker, vaccination reminders, blogs and memory lane! Android user only. iOS coming soon. Can you tell our readers what Tinystep app is? Tinystep is India’s biggest mom club! Moms ask, connect and share everything about their parenting journey, get guidance and build a support system together. Tinystep springs from the observation that there is an apparent gap in society when it comes to family dynamics. Joint families are a thing of the past. The rise in nuclear families has led to a gap in information being passed down to future generations. A friend of mine and his wife had found out that they were pregnant. And it shocked me, the struggle they had to go through just for the most basic information. This really struck me back then, and this domain needed something like Tinystep. How can the app help parents and caretakers? Tinystep is the one app that every parent needs when they have a question, when they want to make a decision, make mom friends, meet people who can help them with a service, when they want to casually browse through content or share and save their parenting/baby memories. Can you briefly explain what are the features available in the app? We start off by introducing moms to birth clubs. These are auto groups connecting moms with 50 other moms who are similar to them. Q&A, an open forum where moms post questions and get answers. Chat - individual and group chat groups across all topics and themes. Feed - Mom sharing daily content in the world of parenting. Memory Lane - A seamless timeline of your baby’s pictures, saved for life. Which part of Tinystep that you like the most and why? It’s our app, and we’ve worked hard on it. We love the whole app! Can you tell us why Tinystep is different from other baby apps? Tinystep apart from being and all in one app, it is also the parenting app you’ll find where moms are encouraged to discuss parenting with others rather than us randomly throwing information at them. Who are the team members that design and develop Tinystep? We are a team 21 people as of now. Where can our readers download the app? The app is currently on Android. You can find it on google play store. Find the download link here. Tinystep is currently available for Android user only. Do you plan to release an iOS version soon? We’re already working on the iOS version, should be out soon. What other feature you are planning for the app in the future? We will be introducing baby care services which users can book instantly on the platform itself. If our readers like to provide feedback to the app, where can they submit their feedback? We have an online feedback chat system on the app itself. Can you tell us about Tinystep blog? The blogs we cover ranges from mom experiences, stages in pregnancy to birth and medical, health-related topics and post pregnancy. We focus on food, health & fitness related blog topics in general. Do You Like This Interview? Love this interview and want to read more? Head to our interviews section and read on different parents whom took up entrepreneurship and created beautifully and excellent baby products from clothing to mobile app and much more. Their stories are sure to inspire you! At BabyDotDot, we love to listen to your success stories. If you are currently doing anything related to baby, children and parenting stuff and wish to get us to feature your work, drop us an email here and we’ll get back to you. Talk to you soon! Read the original post The 18 Best Dehumidifiers for Home Use (A Healthy Air for Your Family) on BabyDotDot - Baby Guide For Awesome Parents & More. Maintaining proper humidity in your home is essential for your health especially when you have young children at home. Optimum moisture level also helps to take care thing like preserving your house furniture and clothes from growing molds. Selecting any one of the best dehumidifiers for home use in the list below will ensure your home humidity level will always keep to optimum and healthy. How Do Dehumidifiers Help You? ​Do You Need a Dehumidifier? ​In our case, the storage room under the stairs and pantry is troublesome for my family. I always find molds and mildew grow inside the cabinets and I have to consistently clean them off. ​Dehumidifiers are used to bring down humidity level to make a comfortable living for you, and prevent common allergens from growing. I think of these allergy triggers as being similar to cockroaches and pests, which needs to be eliminated or taken care of. Stuffy nose, difficulty in breathing, wheezing or sneezing. If any of your family members are constantly suffering from the above-mentioned conditions, check the humidity level of your home and consider using one of the best dehumidifiers we have selected on this post. While you need to keep your home humidity level in check but when humidity is too low, it will cause health issue as well. Particularly during the cold months where the humidity level is low, using a humidifier can help to elevate the humidity to the optimum level. If you are experiencing low humidity level, then click here to see the list of best humidifiers that is suitable for home use. Sometimes, the higher content of moisture in the air may not cause too much of a problem regarding health, at least the symptoms may not be so evident. However, over a period, the signs and symptoms of respiratory or skin irritation may worsen. ​In particular, if there is a family member who is showing asthma-like symptoms, that makes the management of humidity more important. We looked for the best dehumidifiers for your family and picked the top ones based on the net customer satisfaction. Instead of you spending several hours looking through all kinds of dehumidifiers, we will show you the best dehumidifiers under $200, best dehumidifiers under $100, the best dehumidifiers with pump and best portable dehumidifiers that we have found through our careful research over hundreds of dehumidifiers that is suitable for any home use. Depending on the space your want to dehumidify, there is no one dehumidifier can fit all size. Generally speaking, the more expensive the dehumidifier unit, the better it dehumidify function and cover wider area. The units featured here are all portable, which means you can bring them to different parts of your home. Even if there is a recommended coverage space, the actual performance shows that humidity level in a given space is often uneven. As can be expected, the area nearer the dehumidifier will have less moisture than the farthest areas. ​Before you start searching for a dehumidifier, it is highly recommended that you take a measurement of the space where you will use it. Focus on units that can cover the space to save more time. Once you have a list of units that fits your needs, make sure they are not included in the list of dehumidifiers that were recalled. ​It is also recommended that you pick a humidistat when you purchase a humidification system. A portable humidistat allows you to measure humidity level in different areas and is often more accurate than built-in ones. ​We hope that this post has helped you to pick up the best dehumidifiers for your home. Your family deserves a healthier environment inside the house. Manage the humidity level, and you have fewer health concerns to worry about, and more time to live comfortably. Read the original post The 3 Best Vaporizers for Babies (Most-Liked Warm Mist Humidifiers) on BabyDotDot - Baby Guide For Awesome Parents & More. Vaporizers are great for alleviating the symptoms caused by clogged airways. Traditionally, parents use boiling water and let children inhale the steam to decongest and clear airways. For this post, we are focusing on the best vaporizers for babies from humidifiers that can produce warm mist to control humidity levels. Humidifiers are used to add moisture to the air, and it is typically used during the cold months where the air tend to be dryer. The intention of using a humidifier is to combat dry climates or relieving cold and flu symptoms. A vaporizer, on the other hand, is a type of warm mist humidifier that uses boiling water to create hot steam which can be burning hazard. However, advanced vaporizers nowadays built using a safer technology like the ultrasonic to create the warm mist instead boiling the water. Both appliances can ease discomfort when used at the right time, but regular maintenance like cleaning the water chamber once a week is necessary to decrease the risk of bacterial growth. One of the benefits of using humidifiers that produce warm moisture is that they are ideal during cold days. At the same time, generating hot moisture potentially is a hazard when used in your baby or child’s room. ​For that reason, most manufacturers do not produce warm mist humidifiers today. ​Having said that, there is a market for families who can ensure the safety of children from accidental burns. ​The few companies who continue to market warm mist humidifiers understand that it is more costly for families to have two kinds of humidifiers, so they have come up with models that can produce both cool mist and warm mist. ​The best vaporizers for babies featured here are all multi-function electronic devices that use ultrasonic technology to produce moisture. ​Each of these units can be set to create a cool mist or warm mist that is ideal for all-year use, no matter the season. Additionally, two of the three units are designed to function as essential oil diffusers besides humidifying your baby’s room. ​Click here for the best essential oil diffusers for babies and here for the best whole house humidifiers for families with children if you need to humidify multiple rooms. Micro-Tech 4500 is one of the top rated cool and warm mist humidifiers in terms net customer satisfaction. Besides functioning as a humidifier that can be set to disperse cool mist or warm mist, it can also be used as an aromatic diffuser and air ionizer. ​The unit disperses moisture into the air quietly by using ultrasonic technology. Large 4L water tank allows the unit to operate for up to 18 hours. Bionaire’s BUL9500B-U is an ultrasonic humidifier that is designed for quiet operation and disperses warm or cool moisture in your baby’s room. A demineralization cartridge is included which is useful in preventing the formation of white dust as a result of the minerals in the water used. The BUL9500B-U comes with a 2-gallon water tank that allows it to run for up to five days. The TT-AH006 is what could be described as a do-it-all ultrasonic humidifier that can also function as an essential oil diffuser. Depending on your needs, you can switch between cool mist on hot summer days or warm mist during cold days. It is able to heat the mist flow up to 38°C in 30 minutes. The TT-AH006 has a built-in water filter that removes bacteria and bad odors from the water. It also has a disposable air filter to purify the inlet air to ensure that the moisture dispersed in your baby’s room is clean. Besides adding humidity to your baby’s room, TaoTronics designed the TT-AH006 to function as an aromatic diffuser. You can add a few drops of essential oil in a separate oil container and have up to 2-3 hours of vaporization. Click here to see our list of the best essential oil diffusers for babies. TaoTronics TT-AH006 has a large 6L tank that allows the unit to work through the night. Should water level drop too low, the unit will automatically shut down. We base our selection of the best vaporizers for babies based on net customer satisfaction. What makes it hard to find products is that the few models of higher than average satisfaction ratings were buried deep in the massive number of cool mist humidifiers. Even so, we managed to pull three products from Micro-Tech, Bionaire, and TaoTronics can fulfill your needs if your purpose is to humidify your baby’s room. ​Depending on your water supply source, and especially if you are using hard water, then Bionaire’s BUL9500B-U﻿﻿﻿﻿﻿﻿﻿ Warm and Cool Mist Ultrasonic Humidifier with demineralization cartridge may be suitable for you. ​Hard water contains minerals and when moisture is produced and added to the air, white dust is formed as by-products. The demineralization cartridge prevents minerals from being dispersed into the air. This eliminates white dust being a health concern such as allergies. ​Today, more and more people are realizing the benefit of using essential oils. Unfortunately, essential oils cannot be used on humidifiers – unless the unit was designed to work with oils. ​Both the Digital Micro-Tech 4500 Ultrasonic Cool & Warm Mist Humidifier and TaoTronics TT-AH006 Warm & Cool Mist Humidifier were designed to function as aromatherapy diffusers. If that is a functionality you need, then going with either of the two are great choices. Your needs may not be necessarily the same as other families. The best way to decide which one to pick is to visit each of the three products and read the customer reviews. Once you have decided and purchased, do resist the urge to use the unit immediately. Take the time to read the manufacturer’s manual to fully understand what the unit can and cannot do, and operate it safely. All the above featured best vaporizers for babies are single room warm mist humidifiers that need maintenance. Keeping it clean and well-maintained will ensure the unit works flawlessly and will service your needs for a long time. We hope that this post has helped you to choose the best vaporizer for your baby. If you think we miss out any good vaporizers, do let us know by leaving you comment below. Read the original post The 32 Best Essential Oil Diffusers (Useable as Humidifier For Babies Too) on BabyDotDot - Baby Guide For Awesome Parents & More. Essential oils have been around for a long time. Its benefits have been documented dating back thousands of years. Essential oils are extracted from botanical sources. The question is, how do you benefit from the extracts? The easiest and safest way is to use diffusers. Purchasing one is easier said than done. We make it easy for you with this list of the best essential oil diffuser and also function like a humidifier too. Click here if you are looking for the best standalone console type humidifiers for your family, or here if you are looking for whole house humidifiers. Keep in mind that essential oils cannot be used with humidification systems unless it is designed to diffuse essential oils. So much has been documented about the benefits of essential oils to emotional, physical, and spiritual wellness. Here are some of the reasons why you and your family should take advantage of the benefits of essential oils. Relaxation and Sleep. Chamomile, lavender, and clary sage are known for their ability to help you relax after a hard day at work and sleep better at night. Positivity. Sweet orange, jasmine, rose, scotch pine, sandalwood, and vanilla are some of the essential oils that help you de-stress and elevate your mood. Better Health. Tea tree, sage, rosemary, grapefruit, lemon, and thyme are known for their anti-microbial and therapeutic properties. These essential oils can also help boost your immune system. Easier Breathing. Peppermint, rosemary, lemon, and eucalyptus are great essential oils to help you reduce inflammation and congestion in clogged airways for easier breathing. Pain Reliever. Ginger, chamomile, lavender, eucalyptus, clary sage, rosemary, and bergamot may be used to extend the effects of pain relievers. Improved Brain Function. Peppermint, eucalyptus, lemon, and pine helps in de-stressing and elevating your mood helping you focus. Some are known to balance hormones and help improve brain function. Insect Repellants. Clove, lemongrass, rosemary, and cedarwood helps ward off house flies, fruit flies, moths, and other insects. Keeps You Cool. Peppermint, eucalyptus, spearmint, and wintergreen essential oils, when used with a humidifier helps you feel cooler, especially during hot days. Diffusing essential oils in the air is as easy as adding a few drops to water in the tank of a diffuser, where vapors are formed and dispersed. As more and more people now realize the significant benefits of using essential oils, manufacturers and importers have flooded the market with an unbelievable number of products. Traditionally, essential oil diffusers (also known as aromatherapy oil diffusers) are separate products from humidifiers. Innovation has changed that. Today, humidifiers that function as essential oil diffusers has become mainstream products. Not only are they more affordable, but they also come in countless styles and designs. ​From several thousands of products available online, we have chosen the ones that have the best customer satisfaction ratings. All the products listed are the best essential oil diffusers for babies and the rest of the family. The list was split into diffusers that have the water tank capacity of above 200ml and below 200ml. Depending on which capacity you need, picking any of these diffusers featured here is an excellent pick. More than being a simple diffuser, they are also used as humidifiers. All of the products listed have essentially the same function – that is to disperse essential oil and moisture in the air. Unlike humidifiers whose sole purpose is to control humidity, essential oils can be used depending on your needs. ​What is more important than picking the best humidifiers for babies is to understand what essential oils are and how one is different from others in the market. Click here for more safety information and here for a list of essential oils. ​Babies are more sensitive than adults hence these products need to be safe for use with the little ones. Because these are electronic devices, you need to make sure that you follow the manufacturers recommended usage and maintenance. Read the original post The 8 Best Humidifiers for Babies – Keeping the Air Healthy and Comfortable on BabyDotDot - Baby Guide For Awesome Parents & More. Have you noticed why you are having drier skin or itchy eyes when staying at home? It could be because of low humidity. For a family with a baby or toddler, maintaining the proper amount of moisture in the air is important for two reasons – comfort and health, especially that of your child. Finding the best humidifiers for babies is not an easy task. Searching Amazon for the word ‘humidifier’ generates over 100,000 results. Let us do the heavy lifting for you, and so you can focus on what is important – selecting the best humidifier for your baby. Our aim on this post is to provide you with general information on the benefits of using a humidifier in your baby nursery and present you with products that were chosen in order of net customer satisfaction rating. In this post you will find the standalone humidifiers where you can easily move around your home and the c﻿﻿ompact humidifiers for travelling use. ​No matter how good or promising a humidifier is, the feedback of people who have used them and how satisfied they are outweighs the marketing claims of the companies who make them. There are different kinds of humidifiers in the market today. There are units that are mounted to home central heating ventilation and air-conditioning (HVAC) system to humidify the whole house. There are also standalone units that could be used to humidify large homes with multiple rooms. ​We are limiting the products on this post to those portable units that are used for single rooms. These units perform the core function of a humidification system – that is to add moisture in the air. As the temperature outdoors get colder, the air gets drier. Less moisture in the air potentially leads to skin and respiratory problems. If it is uncomfortable for you, think about what it must be like for your baby. ​Proper levels of humidity in the air may help in relieving symptoms of cold, allergy and asthma by keeping the nasal passages moist, which helps speed up the process of healing. Other benefits include prevention of nosebleeds, dry skin, itchy skin, cracked skin, and lips. ​Proper humidity is not only for your family’s health but also for things inside your room. For instance, you can prevent your wood furniture or floor from cracking or warping. How does a humidifier add moisture in the air? Put a bowl of water in the room, and that’s what they did centuries ago. Today, manufacturers use oscillating plates to vibrate and transform water into a fine mist that is blown and dispersed in the air. ​It’s a good thing that there are now more people who understand the necessity of using a humidifier, and this has led to innovations. The newer technology has minimized or eliminated white dust as a by-product, which can pose a serious threat to people with breathing problems. Mass production has lowered the costs. In some ways, there is not much improvement one can do on ultrasonic technology, so manufacturers have been coming out with stylish designs. What differentiates one from another is the quality of components used. While it is impossible to get all products in the market to tear them down and look at each of the hundreds of components. However, customer satisfaction is a good indicator, and those that are highly rated are good starting points for you. The following humidifiers are useful in single rooms. Click here for the best whole house humidifiers and here for the best furnace humidifiers for families with children. Besides covering humidifiers that are placed on tabletops, the next section covers the best travel humidifiers. On some cases, you may have to go on the road with your little one. Travel humidifiers are small units that you can conveniently bring in your bag when you visit and stay over at your parent’s house. It can also be brought to other places and used in hotel rooms. Ultrasonic humidifiers tend to be quiet. It’s not completely noiseless, but the noise level it generates is at a low level that it should not bother you. Unless there are reasons not to, the top two picks are the highest rated single room humidifiers in terms of customer satisfaction. ​Travel humidifiers are to be considered quick fixes and the only advantage it has over the tabletop models is portability. In general, they are not as efficient as the console models. During hot summers and cold winter season, humidity level inside your home either increases or decreases. A humidity level of 30% to 50% reduces health concerns and lets you and your baby live in comfort. All the products featured here do not come with a humidistat. As you pick a suitable product from the list of best humidifiers for babies, it is highly recommended that you pick up a portable humidistat to measure humidity in your home. By measuring the humidity level, you would know when it might be appropriate to turn a humidifier on or off. Another thing to remember is that these are stand-alone humidifiers were not designed to work with essential oils. Click here for a list of the best humidifiers for babies that function as essential oil diffusers. No matter how good or promising a humidifier is, the feedback of people who have used them and how satisfied they are outweighs the marketing claims of the companies who make them. We are limiting the products on this post to those portable units that are used for single rooms. These units perform the core function of a humidification system – that is to add moisture in the air. Proper levels of humidity in the air may help in relieving symptoms of cold, allergy and asthma by keeping the nasal passages moist, which helps speed up the process of healing. Other benefits include prevention of nosebleeds, dry skin, itchy skin, cracked skin, and lips. Proper humidity is not only for your family’s health but also for things inside your room. For instance, you can prevent your wood furniture or floor from cracking or warping. It’s a good thing that there are now more people who understand the necessity of using a humidifier, and this has led to innovations. The newer technology has minimized or eliminated white dust as a by-product, which can pose a serious threat to people with breathing problems. Travel humidifiers are to be considered quick fixes and the only advantage it has over the tabletop models is portability. In general, they are not as efficient as the console models. Read the original post The 10 Best Whole House Humidifiers for Family and Baby on BabyDotDot - Baby Guide For Awesome Parents & More. A good family relationship and great humidity control turn your house into a comfortable home. If humidity is uncontrolled, the less-than-ideal living condition could cause you to become uncomfortable, edgy, and have respiratory and skin conditions. Take control of your home with our roundup of the best whole house humidifiers that has immediate health benefits for your family and baby. Humidifiers could be for a single room, or as featured on this post, whole house. Essentially, it functions as a device that emits water vapor to space around to raise the humidity level. As the climate gets cooler (and towards winter), the air gets drier. 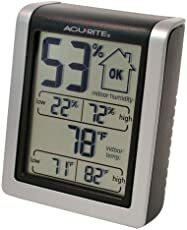 âKeeping humidity around 40% is ideal (Use an AcuRite Humidity Monitor to help you keep an eye on the humidity level around your house). If humidity is too ï»¿ï»¿ï»¿ï»¿low, certain conditions such as dry skin, irritation in the nasal passages and throat, and itchy eyes, may occur. On the other hand, if humidity is too high, your home may feel stuffy and could cause condensation on the walls, floors and other surfaces that trigger the growth of ï»¿ï»¿dust mites and molds. These allergens cause allergy and asthma flare-ups, and other respiratory problems. âAnyhow, maintaining an ideal humidity level is especially important if you have babies at home, as their young body is not strong enough to constantly combat illnesses like mentioned earlier. âBesides your family and babyâs health, maintaining proper humidity level helps you prolong the service life of your wood furniture and flooring, and wallpapers too. Whole house humidifiers, also called central humidifiers, are the ones that can maintain the proper humidity of multiple rooms and spaces in the house. There are manufacturers that have console type (tabletop) standalone units and claim that these works for the whole house. Although it works, the most efficient ones are the ones that are installed directly on your home heating and cooling system. âThe best whole house humidifiers need to do one thing and do it well â that is to maintain optimal humidity to protect your family and baby. Bypass Humidifier. This device takes hot air directly from the furnace. The hot air will absorb water to create and emit warm mist after passing through a filter. Fan-powered Humidifier. This device sends mist into the air using a fan to blow water to go through a filter. Steam Humidifier. This device boils the water to form steam that is dispersed into the air. Install the AprilAire 700 directly to the duct of your heating and cooling system to humidify up to 4,200 square feet area by dispersing up to 18 gallons per day of humidity. There is no need to fill water multiple times a day because this unit is hooked up to a water line. Using a built-in fan, the unit pulls warm air directly from the furnace to increase its effectiveness. The automatic control that comes with Model 700 accurately reads and delivers the appropriate amount of humidity throughout your home. There is also no need to manually calculate the humidity level based on indoor and outdoor temperature. Spend less time maintaining the unit and more time for your family and baby. AprilAire manufactures some of the best whole house humidifiers in the world. Model 600 has the highest net satisfaction ratings in Amazon, a testament to its proven quality and reliability. At the top of our list is the Model 600. 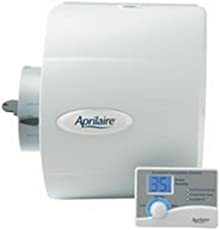 The Aprilaire 600 bypass whole house solution efficiently humidifies an area of up to 4,000 square feet by dispersing 17 gallons per day of water. It is mounted directly to the duct of your heating and cooling system and is also easily reversible for right or left-hand installation. Connect the unit to a water line for hassle free constant supply of water. The automatic control unit that comes with Model 600 accurately detects and delivers the proper amount of humidity in your home. It takes a measurement of outdoor temperature and humidity. Then it uses a formula that factors in the indoor temperature and humidity to determine the optimal levels making it an ideal whole house humidifier for the family. AprilAire 600 has the same coverage space and evaporative rate as AprilAire 400. One of the key differences is that Model 600 uses less electricity. For small to mid-sized homes, the AprilAire 500 is the ideal whole house humidification solution for you. It efficiently humidifies up to 3,000 square feet and disperses up to 12 gallons of humidity per day. This AprilAire bypass humidifier is mounted directly to the duct of your heating and cooling system. Mounted on the supply or return duct (plenum), it is easily reversible for right or left-hand installation. Also, the unit is connected to your water line, there is no need to worry about filling it with water. The automatic humidistat control determines the proper humidity level your home needs by sensing the humidity level, indoor and outdoor temperatures. The AprilAire Model 500 is also an excellent whole house humidifier for baby. 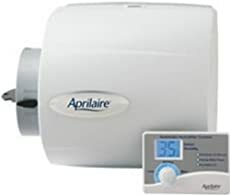 The AprilAire 400 is an efficient, high capacity, water conserving, and drain-less humidifier that uses evaporative technology to humidify up to 4,000 square feet and disperse up to 17 gallons per day of humidity. It is mounted directly to your heating and cooling system. Model 400 incorporates a recirculation of water by using a special water panel within the system. Gravity pulls the water down to the bottom of the unit while the water panel uses a wicking action to draw the water back up to the top, recirculating it until all of the water deposited into the unit is used. AprilAire 400 comes with an automatic humidistat with an outdoor sensor. The humidistat will mount directly to your heating and cooling system to accurately detect and deliver the appropriate amount of humidity to your home by receiving outdoor temperature and humidity information from the outdoor sensor. AprilAire 400 has the same coverage space and evaporative rate as AprilAire 600. One of the key differences is that Model 400 uses less water. Based on Amazonâs net customer satisfaction ratings, the AIRCARE MA0800 is the best console evaporative humidifier in the market. This unit can humidify up to 2,500 square feet with 8 gallons per day of humidity. The advantage of console type humidifiers is that it can be moved around if necessary. Instead of placing different humidifiers in multiple rooms, this standalone unit can be used to humidify the whole house. Water refill and check filter indicators help you monitor the unit and add water or change filter as needed. The easy-fill tank can hold 2.5 gallons of water. Use the MAF2 wick to enjoy the benefits of the antimicrobial protection. Essick Airâs movable console type evaporative humidifier eliminates the use of several smaller humidifiers in your house. 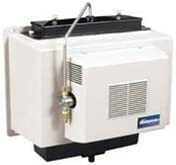 The MA1201 is designed to humidify more than 3,000 square feet of space with 12 gallons per day of humidity using a 3.5-gallon easy-fill tank. Controlling the humidity level is easy with the adjustable humidistat. Auto shutoff ensures the unit will not run when water is empty. Move the unit from one location to another with four castors. Using the MAF1 antimicrobial wick should have significant health benefits, making the MA1201 one of the best whole house humidifier s for the family. Honeywell claims that the TrueEASE HE300A1005 uses up to 50% less water and save energy by eliminating the constant cycling of air, making it an eco-friendly unit. This fan powered evaporative whole house humidification solution covers up to 3,000 square feet by dispersing up to 18 gallons per day. It is mounted directly to the duct of your heating and cooling system. You can hook this model to your water line, so there is no need for constant filling. The automatic HumidPRO humidistat control unit that comes with the HE300A1005 is installed directly on the heating and cooling system, preferably the return duct, to ensure comfortable humidity levels throughout your home. The only maintenance needed is a seasonal change of the humidifier pad. Honeywell TrueEASE HE300A1005 is one of the few fan-powered humidifiers to make it to this list of the best whole house humidifiers. Essick Airâs portable solution to using an evaporative cool mist type humidifier in multiple rooms in your home is the AIRCARE EP9 800. The EP9 800 model also comes with an adjustable humidistat that allows you to control the humidity level in your home and cover spaces up to 2,800 square feet. Filling the tank with water is made easy with a front-fill reservoir that can hold 3.5 gallons of water. An auto shutoff feature ensures the EP9 800 will not run when water runs out causing dryness in the air. This is a standalone unit that can be moved from one spot to another with four casters. Essick Air recommends using its 1043 wick with the humidifier to ensure your family, especially young children and babies, are protected by one of the highest capacity antimicrobial filters in the market. The AprilAire 800 model is a fully automatic home humidification solution that is designed for remote or duct mount with no additional accessories needed. It is ideal for large homes with a coverage area of up to 6,200 feet. This steam humidifier uses the latest absorption and dispersion steam technology to disperse up to 34.6 gallons of humidity per day into your heating and cooling ducts through a dispersion tube without causing condensation problems. The unit also comes with an automatic humidistat that is mounted directly on the heating and cooling system to detect and deliver the proper amount of humidity in your home. There is no need to manually adjust the level based on outdoor temperature as it does this automatically for you. Under normal conditions, maintaining the AprilAire 800 model is as easy as replacing the canister annually and inspecting/cleaning the unit every 500 hours of use. For large families and big houses, Model 800 is the best whole house humidifier for baby and the rest of family. AIRCARE EP9 500 is a standalone humidifier with a digital humidistat that automatically maintains the humidity level you set. This evaporative cool mist multi-room humidifier has a 3.5-gallon easy-fill first reservoir that outputs 9 gallons of humidity every 24 hours covering a space of up to 2,000 square feet. For portability, four casters allow you to move the unit from one part of the house to another. Maintenance is easy with the AIRCARE EP9 500. You replace the wick, which traps minerals and impurities in water, twice a season. Replacing the wick ensures the delivery of clean and healthy humidified air in your home. Optionally, you could add Essick Airâs two-stage air filter that ensures your family breathes the cleanest air possible. There are many great brands and products in the market. While companies would always show the benefits and quality of their products, the opinion and experience of customers are the most reliable source of information. The first thing you need to do is to determine which type of humidifier you need. Do you have a heating and cooling system in your home? If so, pick the bypass or steam humidifier from AprilAire, or the fan-powered unit from Honeywell. If you prefer to use a console type whole house humidifier, Essick Air is an excellent choice. Keep in mind that console type humidifiers are can be too noisy for your comfort level. âAfter determining the type of humidifier, it is a no brainer to pick a model that covers the area of your home. After purchasing and installing, expect to realize the health benefits of the best whole house humidifiers for family and baby featured here. If you are not sure about how to install a humidifier to your home heating and cooling system, always seek professional help from your local company that provides air conditioning installation services. Furnace humidifiers are usually built-in as part of the heating, ventilation, and air conditioning (HVAC) system or installed near the furnace. It can only be used when the furnace is running. The health benefit of a home humidification system to your family, especially children, and babies makes it a necessity during times when the air is drier. We make it easy for you by compiling the best furnace humidifiers in the market. When the temperature goes down during the cold or winter season, turning on the heating system to increase the warmth indoors, which raises the dryness in the air. The drop in humidity levels to less than 30% RH (relative humidity) may cause respiratory infections that thrive in sore or raspy throats, nasal blockages, aggravated asthma attacks, and others. For healthy and comfortable living inside your home, raising the moisture in the air minimizes or eliminates skin and respiratory health concerns. Here is also an informative video no why a furnace humidifier is important. Your children would love to play in different parts of the house. If you have a baby, you would need to keep the baby with you at times throughout the day while you do your chores. Instead of using standalone or portable cool mist single room humidifiers, you might as well use one of our selections of the best furnace humidifiers to ensure a healthy environment for your whole house. There are only a few manufacturers of furnace humidifiers. What we have is a list of trusted brands and the models that have received excellent customer satisfaction ratings. The AprilAire Models 400, 500, and 600, bypass humidifiers are mounted directly to the duct of your heating and cooling system. Because the unit is connected to your water line, there is no need to worry about filling it with water. Both Models 400 and 600 have the same coverage space and evaporative rate. Due to a slight technology different, the key difference between the two is that Model 400 uses less water, while Model 600 uses less electricity. AprilAire 700 has a built-in fan that pulls warm air directly from the furnace and disperses up to 18 gallons per day of humidity over an area of up to 4,200 square feet. There is no need to fill water as the unit is hooked up to a water line. The automatic control that comes with Model 700 accurately reads and delivers the appropriate amount of humidity throughout your home. There is no need to manually calculate the humidity level based on indoor and outdoor temperature. 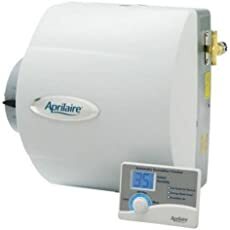 The AprilAire 800 model is a fully automatic steam humidifier uses the latest absorption and dispersion steam technology to disperse up to 34.6 gallons of humidity per day into your heating and cooling ducts through a dispersion tube without causing condensation problems. This unit is ideal for large homes with a coverage area of up to 6,200 feet. The automatic humidistat that is mounted directly on the heating and cooling system accurately detects and delivers the proper amount of humidity in your home. Model 1000A is a fan-powered whole house humidifier that mounts easily on the warm air plenum and delivers up to 18 gallons of humidity per day covering an area of 3,000 square feet. The GeneralAire’s GFX3 Automatic Digital Humidistat features a manual or automatic mode with an outdoor sensor for temperature compensating control. Warm air is pulled by a fan inside GeneralAire’s Model 1137 or Model 1042LH from the furnace through the water-soaked Vapor Pad, where additional moisture is absorbed and dispersed throughout your home via the duct system. The MHX3C humidistat allows you to manually control the humidity level. Honeywell’s TrueEASE HE300A1005 is fan-powered evaporative whole house humidification solution that covers up to 3,000 square feet by dispersing up to 18 gallons per day. It is mounted directly to the duct of your heating and cooling system. The automatic HumidPRO humidistat control unit is installed directly on the heating and cooling system, preferably the return duct, to ensure comfortable humidity levels throughout your home. When it comes to the brand that has consistently rated high in terms of customer satisfaction, you can’t go wrong with AprilAire. Having said that, the other brands and models featured here have made a good impression with their customer base. The smallest coverage space in AprilAire’s humidifiers is Model 500 that can humidify an area of 3,000 square meters. If this is the size of your home, you should also check out the GeneralAire’s 1000A, 1137﻿﻿, 1042LH, and Honeywell’s TrueEASE HE300A1005. These models have similar or nearly similar area coverage and are all fan-powered whole house humidifiers. For larger homes, AprilAire offers units that can cover 4,000 to 6,200 square feet. Regardless which model you end up with on this roundup, you are assured of having purchased one of the best furnace humidifiers for your family and children.